From The Archives: OUTLANDER (2008). The other day, I found a stack of my old artwork from my high school years. I didn’t remember myself as being the little metalhead that the evidence suggests that I was, but the proof is in the paper. Rock on, little fella! What metalheads and teenaged cartoonists and the producers of Outlander all have in common is a love of monsters and irrationally pretty girls and violence without consequence and bygone eras where hairy armored badasses swung swords at each other. Outlander is a movie I would have loved in high school. Hell, given a $50 million budget, Outlander is a movie I might have MADE in high school. Outlander stars Jim Caviezel (otherwise known as “The Christ”, not to be confused with “The Jesus”) as a space traveler whose ship crash-lands on Earth during the time of the Vikings. His character’s name is Kainan. Kainan’s people are involved in a species war with a breed of aliens known as the Moorwen. One of those aliens is somehow on board Kainan’s ship, and when they arrive in Viking times the alien goes on a murderous rampage. Kainan has to team up with a more primitive society in order to destroy the monster. The movie has, at best, a teenager’s grasp of history – again, this is exactly what my friends and I would have come up with after scanning a few pages of the Viking chapter of our European history textbook. All of the supporting characters are named accordingly (Rothgar, Freya, Wulfric, Gunnar, etc.) and there’s even a character named Boromir, which indicates that someone’s been reading Lord Of The Rings when they were supposed to be catching up on their Norsemen. Also, considering that this is supposed to be Norway, there sure are a lot of different accents on hand – the movietakes pains to explain how Kainan comes to speak the same language as the Vikings, and British accents are par for the course, but no one bothers to explain what the hell the Scottish guy is doing there. The supporting cast features the usual casting archetypes, such as the respected thespian slumming (John Hurt as an aging king), the ingénue who’d clearly rather be doing other movies (Sophia Myles as Princess Leia – I mean, Freya), and a convention favorite doing the rounds (Ron Perlman – you know, that huge low-voiced growly dude who looks like Will Ferrell, if Will Ferrell was a badass.) Both of those guys are good as usual, and Caviezel is good casting too. Sure, I like The Christ. Who doesn’t? The Christ is kind of a badass. 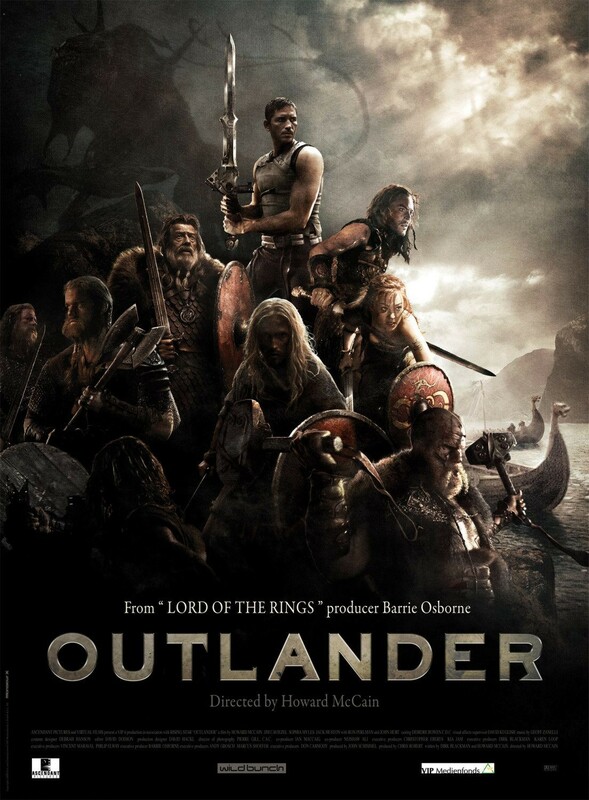 While this genre mash-up is one of the most derivative movies I’ve ever seen (the plot is the pitch: Vikings vs. aliens! ), at least it makes sure to steal from the best. In the first ten minutes alone, I counted four separate, um, homages to Predator, but since Predator is one of my top ten movies of all time, I can hardly complain. Outlander does manage to have a couple neat ideas and doesn’t always go exactly where you expect it will, although mostly it does. Probably the thing I liked best about the movie was the alien. Once you finally see it up close, it’s a good design, with a couple interesting concepts about it. For someone like me, that’s enough to recommend it. I was entertained, take that as you will. It’s not crap. I’ve certainly seen much worse movies become much more popular. Anybody who likes Viking movies and/or alien movies knows exactly what to do with this thing. Also, not to introduce a big idea at the end of thearticle, but upon reflection, I’m starting to wonder what the casting of the lead character is supposed to mean. Jim Caviezel, best known for starring in The Passion Of The Christ, plays a character who arrives from the heavens to bring light and civilization unto a besieged, skeptical world that needs him. Is the whole movie supposed to be some kind of allegory for the spread of Christianity? From The Archives: DRAG ME TO HELL (2009).